Enterprises worldwide have a wealth of application logic and capabilities that have formed the backbone of their online transaction processing (OLTP) workloads for decades. This application logic and these capabilities are core business assets and are industrial strength, proven, and time-tested. The question enterprises are pondering today is: How can they extend the value these applications provide and reuse parts of the applications to reach new audiences? Application programming interfaces (APIs) make it possible for the enterprise's core assets to be reused, shared, and even monetized to produce new revenue streams. APIs act as the digital glue that links services, applications, and systems. The IBM® z/OS® Connect Enterprise Edition helps you to easily create efficient and scalable APIs for today's mobile and cloud applications, effectively creating a bridge between your trusted IBM z Systems™ assets and the new API economy. Your resulting API portfolio is ready for consumption by application developers and API management solutions. 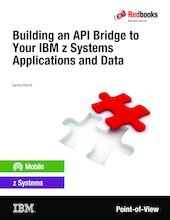 This IBM Redbooks® point-of-view publication describes how you can start with your z Systems assets, leverage the z/OS Connect Enterprise Edition as your API management platform of choice, and collect new sources of information that are primed for analytics and the cognitive era.